A Guide to Helping Your Elderly Mom Add Years to Her Life - All Care Hawaii. LLC. The number of seniors living to the age of 100 is surprising. It’s a goal your mom can achieve to reach. With routine medical care, a healthy diet, regular exercise, and a positive mental outlook, anything is possible. It’s 2018. Now is the perfect time to make small changes. These changes could be all it takes for your mom to become one of the United Nations’ estimated 316,000 in the world who lives to be a century old. Your mom’s diet needs to focus on low-fat, high-fiber, low-sugar foods. Seniors tend to eat appropriately when they have someone to eat with. Your mom lives alone. You and your siblings and family friends should create a schedule and make sure she has weekly visitors. That person can cook a meal and share it with her. When it comes to foods, make sure she’s eating plenty of fruits and vegetables. If she finds them hard to chew, pick softer options. Roasted butternut squash, sautéed spinach, and split pea soup are all options that might be easier for her to manage. Stick to lean proteins and don’t be afraid to add a vegetarian meal from time to time. Instead of a hearty beef chili, skip the beef and add extra beans for protein and fiber. If your mom loves lasagna, make a heartier version with thinly sliced zucchini and eggplant in place of some noodle layers. Experts recommend 30 minutes of moderate exercise five days a week. Your mom could take a half-mile walk during the work week. If she has a dog, she can use her dog to get outside and walk at a steady pace. If your mom’s mobility is an issue, a caregiver can help her on those walks. Your mom could also skip going outside and do chair yoga instead. If she has a ride or can still drive, exercise classes at local senior centers or the local Y are other ways to get enough exercise. Loneliness is one of the key reasons seniors become sad or depressed. Isolation is another. Your mom’s friends have moved away. She’s no longer working, so she doesn’t spend as much time with others. These are common situations men and women face when they live alone and no longer work. The more opportunities she has to get out and meet with others her age, the happier she’ll be. If that doesn’t help, talk to her doctor. Antidepressants may be necessary. Counseling may help. Sometimes, even programs like Yoga are enough to help increase positivity. There’s one other way to make sure your mom has a positive outlook. Talk to a local elderly care agency about the benefits of caregivers. Caregivers do help with light housework and meals, but they also provide companionship and transportation services. 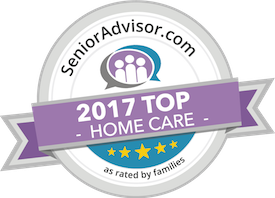 Learn more by calling an elderly care agency today. Have questions about hiring a caregiver in Kahala, HI? Contact the caring staff at All Care Hawaii today.